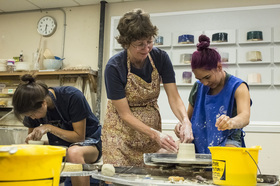 One of my joys is teaching clay classes for children, teens and adults in and around the Davis community. It really is as fun as it looks! Consider joining me for beginning wheel throwing on Thursday nights, 5:15-7:15 at the UC Davis Craft Center, located in the South Silo off of Hutchison Drive. To sign up for my class or one of the myriad other classes available at the Craft Center, go to http://cru.ucdavis.edu/craftcenter. Classes begin the third week of the academic quarter and run for seven weeks. 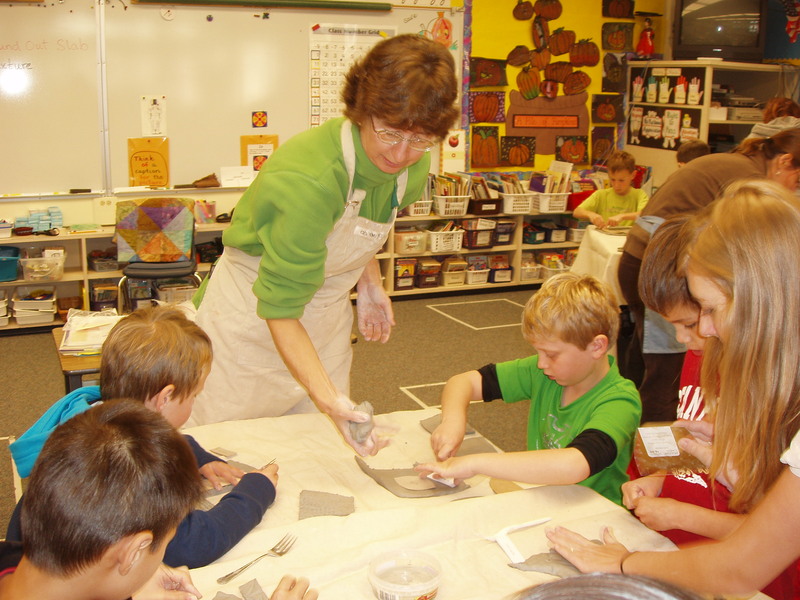 Funded by the Davis Schools Arts Foundation, I bring clay classes to several local elementary schools. 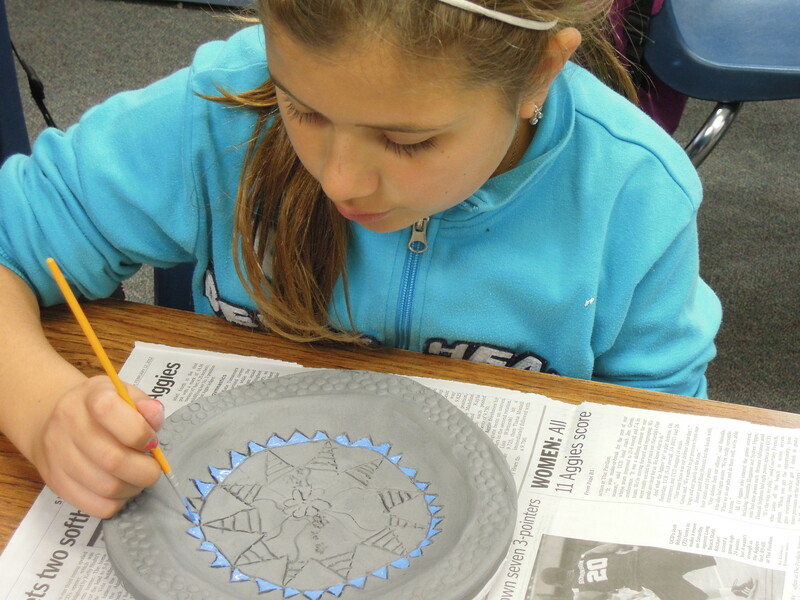 I work with classroom teachers to design clay projects that extend the science, art, math or social studies curriculum at each grade level and that fit with the personality and skill level of each class. If you are a DJUSD classroom teacher, you may access a DSAF Hershberger grant application at http://www.dcn.davis.ca.us/go/dsaf/NewGrants_Awards.html. I typically meet with teachers in early September to plan that year’s project and prepare the grant application. I draft the language describing the project and how it meets California state standards for a given grade level, and the teacher fills in the remaining details and submits the grant. Grant applications must be submitted electronically; please check the website for due dates. My projects encompass both two-dimensional and three-dimensional work and incorporate drawing, carving, painting, sculpting, pinching, slab-building and coil building. One of the best things about clay work is that it requires both hands, which means that it makes both sides of the brain talk to each other – great for children! Here are some recent examples of projects I have done with kids in the Davis schools. The nest is just a pinch pot with texturing added around the sides to represent twigs by pressing clay through a garlic press and attaching with slip. Eggs and babies were attached with slip to the interior of the nest. The bird was sculpted separately and attached to the top of the nest with slip. The flowers were cut from a slab, with optional texturing added using stamps & found objects, and optional features added on with slip. Adult helpers attached a little clay collar to the bottom of each flower to hold the dowel that was inserted after firing. This is a great project for a school with an active garden program. 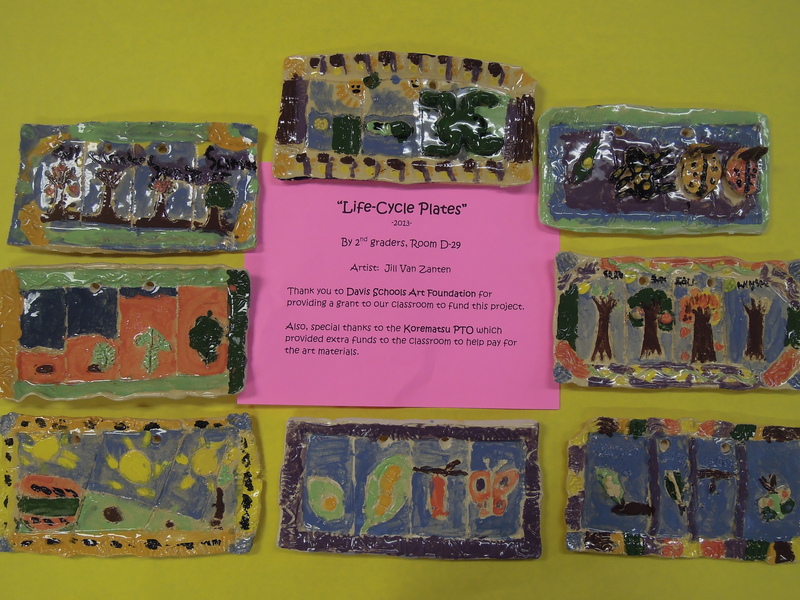 Each plate represents in 2-D a plant grown in the school garden or in a garden at home, showing what the plant looks like both above and below the ground. The freestanding sculpted piece represents in 3-D the fruit or vegetable produced by that plant. 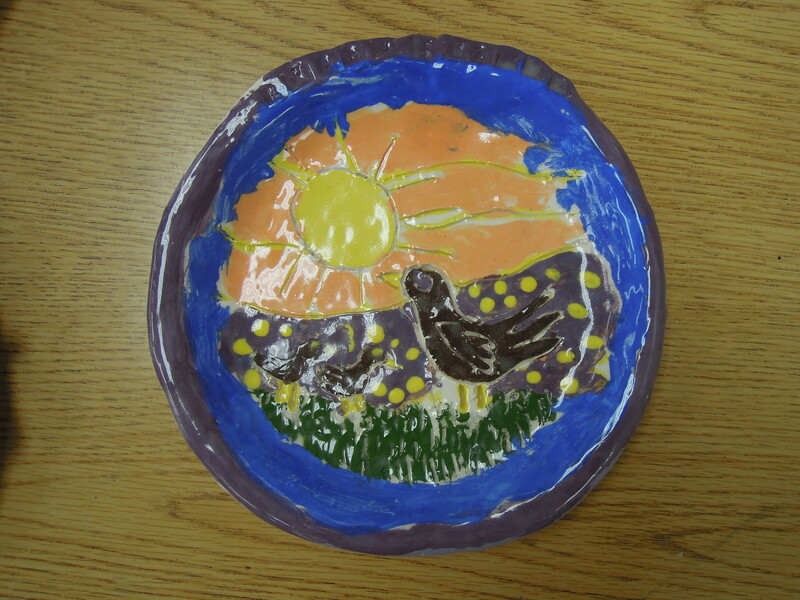 These paired plates represent each child’s way of conceptualizing the notion of “opposites” as studied in the language arts curriculum. As part of their life sciences curriculum the children studied the life cycles of a butterfly, frog, dragonfly and tree. The plaques were formed by pounding out and cutting out a slab and then sculpting the life forms and attaching with slip. Because of the level of detail needed, I had the children paint their pieces with underglaze while in the “greenware” stage and then clear glaze after bisque firing. The students had a class aquarium and were studying about life forms that consume oxygen and produce carbon dioxide, which live together with and depend on life forms that produce oxygen and consume carbon dioxide. Each plate shows at least one of each of these life forms. These are just plain fun to make. They are formed by cutting out a slab base, sides, top and collar for bottleneck, texturing the pieces with stamps, fabric or found objects, assembling as a closed form, cutting a hole in the top and adding the bottle neck, blowing in the hole to inflate, and sculpting a fanciful stopper. These are slab formed, with the idea being that the cup and saucer make up one design unit. The kids collected leaves from home and from the schoolyard to make the imprints. This has turned into an annual tradition. The third classes at North Davis Elementary raise steelhead trout in a special aquarium and chart their growth over the weeks and months. When the fish are ready, the class takes a field trip to release them into the American River. To celebrate these beautiful creatures we make fish plaques, inspired by Japanese fish prints (Gyotaku), using black underglaze to represent their features. This project was done in tandem with a 3rd grade science unit on the basic food groups and what it means to eat a balanced diet. The students formed a round slab which they pressed into a paper plate for stability, and then sculpted food items that would together comprise a healthy meal (for some, alas this included pizza and fried drumsticks). 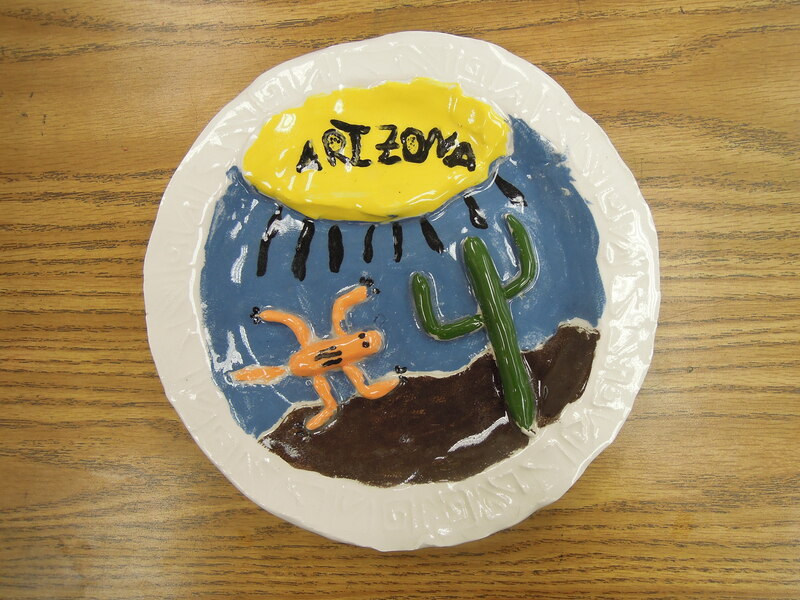 The “food” items were painted with underglaze colors, and after the plates were bisqued, coated with clear glaze. This project takes some patience, fine motor control, and slightly bigger hands, which is why it is more suitable for the upper grades! The pots are coiled and then smoothed and refined using ribs (cut from plastic containers but meant to mimic the gourd pieces traditionally used by Native American potters). Before firing the pots are painted with black and brown underglazes based on Southwestern pottery design motifs. 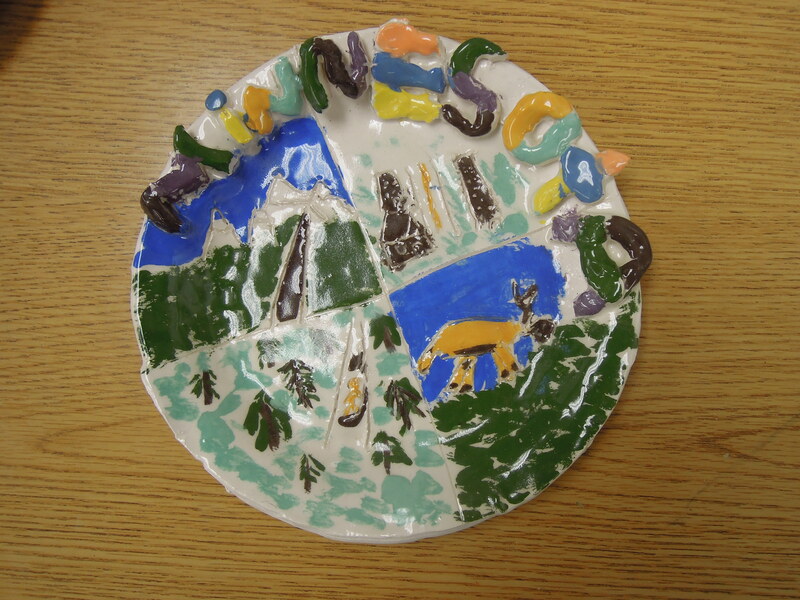 The students made these plates as part of their study of the four zones of California – coastland, desert, central valley, and mountains. Each plate represents one plant or animal found in one of these zones. 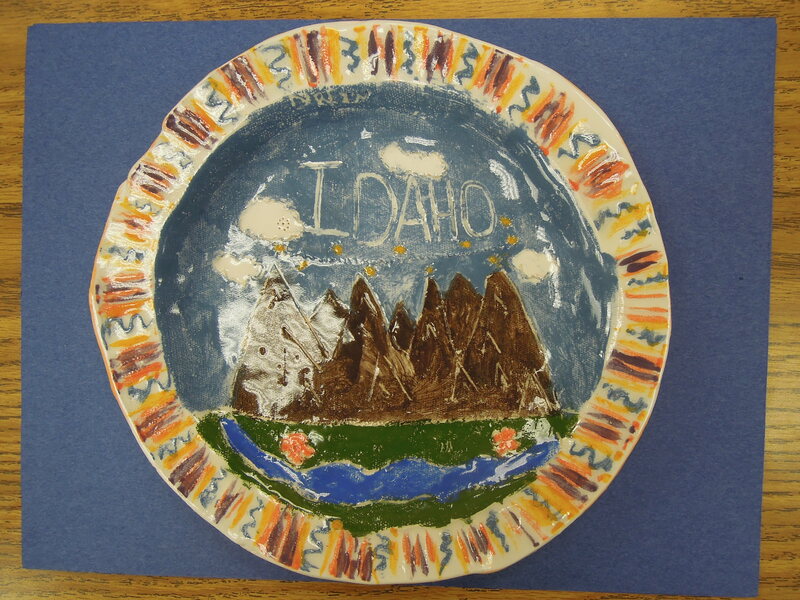 Each student became a specialist on one state and made a plate representing the standout features of that state. Because of the level of detail, I had the students use underglazes for painting, and then we clear-glazed the pieces after they were bisque fired. 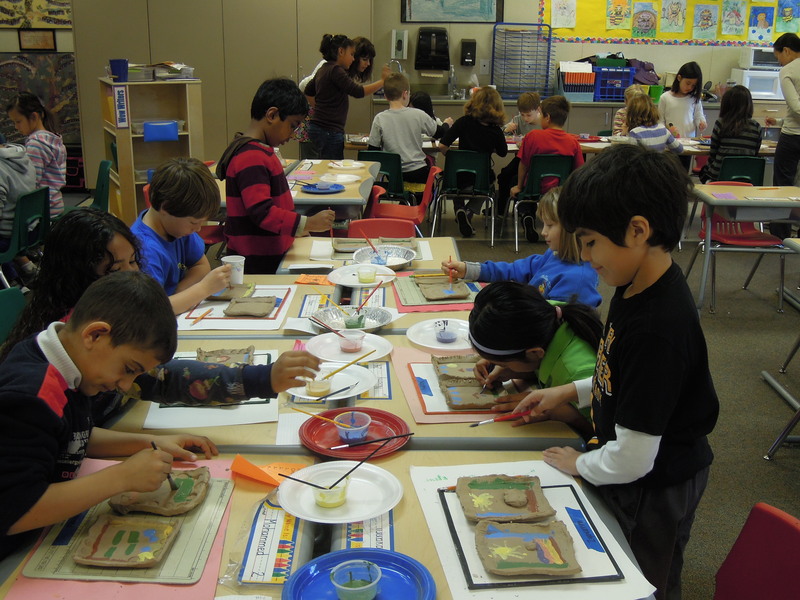 As part of their world civilizations curriculum, the students studied Diwali Rangoli designs used for Hindu festivals. These ceramic plates were slab formed and slump molded into heavy duty paper plates. They were painted using underglazes and clear glazed following bisque firing. The sixth-grade social studies curriculum includes an in-depth study of ancient Greece. The students studied and sketched traditional Greek design motifs and then transferred them to slab-formed plates, using underglaze painting and scraffito. I was recently privileged to spend a couple of Friday nights in Woodland doing clay with Yolo County Foster Teens. These treasure boxes were slab-built using a cross-shaped pattern for the box (so you just have to bring up the edges and scratch & slip them together) and a rectangular pattern for the lid, with a unique knob attached. The teens decorated with underglazes, then clear-glazed. 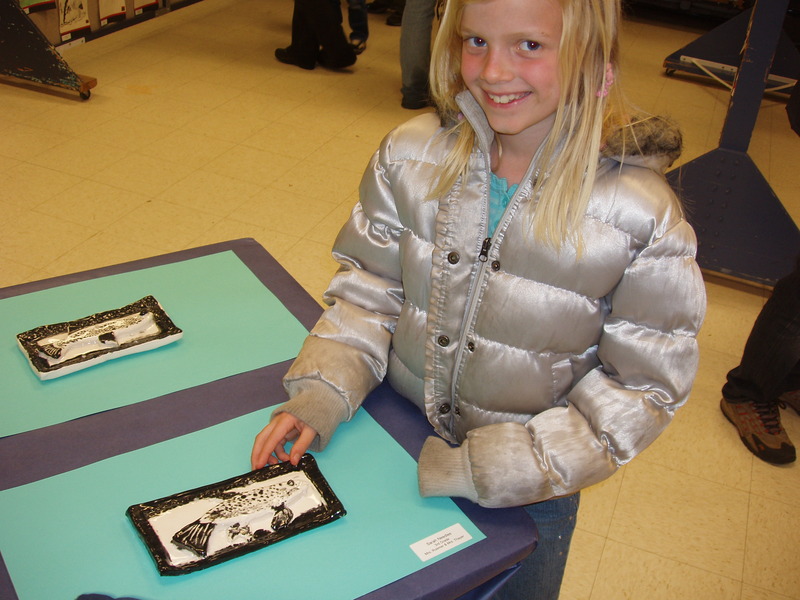 On a second night, the kids brought plants and other texturing objects from home to stamp designs on these slab-built plates. I would be happy to hear from you!